We at dermHA are passionate about good health and community service, and over the years we’ve discovered that many of our clients are as well. We are thrilled to announce our new blog series, “Spotlight on Health & Wellness” to highlight those dermHA users who are doing great work and promoting health and wellness in their communities. We are honored to lead this series with Villanova’s Head Football Coach and long-time dermHA user Andy Talley. Why does Talley care about the quality of his skin care? As a two time National Coach of the Year Award Winner, Andy Talley has spent a lot of time in front of cameras. ”Although I’ve spent a lot of time outdoors, in the sun and in the field with athletes…when I tell people how old I am, they don’t believe it.” Over the past 27 years Talley has lead the Villanova Wild Cats Football team to more wins than any other coach in Villanova history. 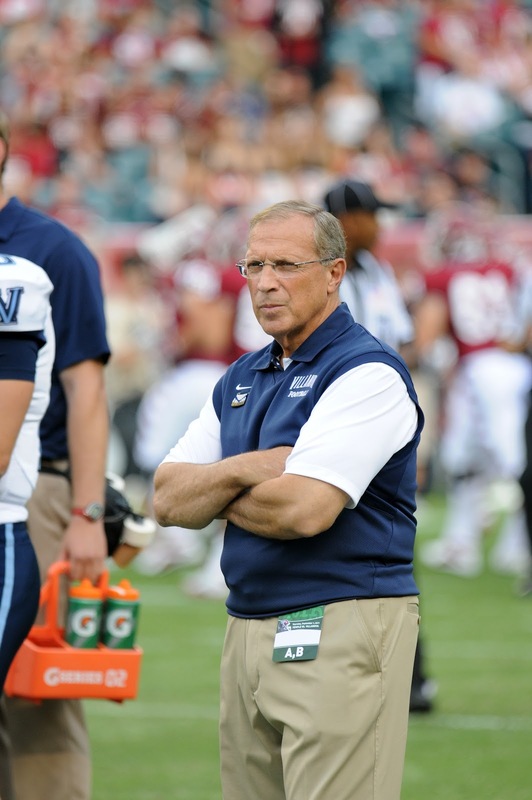 He has guided Villanova to 9 NCAA Playoff appearances, 5 Conference Championships, 3 Lambert Meadowlands Cups, 3 ECAC Team of the Year Awards, 2 National Semi-Finalist appearances, and the 2009 National FCS Football Championship. Coach Talley has been inducted into 6 Hall of Fames and received award after award recognizing his contributions to his teams, the university and his community. In addition to his tremendous accomplishments in football, the challenge Coach Talley is most passionate about is saving lives. In the fall of 1992 Andy became aware of the incredible challenges faced by those in need of bone marrow transplants. He immediately began his life saving work of encouraging people to join the bone marrow donation registry and raising funds to offset the costs of testing. He held annual events at Villanova to have students, student athletes and other Villanova community members as potentially life-saving donors. He promoted awareness and education and began the continuing effort to raise funds for this valuable cause. In 2008 Talley helped to create the “Get in the Game and Save a Life” program for the National Bone Marrow Foundation. This program educates and encourages university students to get tested and registered as bone marrow donors. Since its inception, the program has partnered with 34 other college football programs to take part in this campaign. Since he began his work in 1992, Talley and his advocacy initiatives have been responsible for testing over 30,000 people. Find out more about the Andy Talley Bone Marrow Foundation and how you can get involved at www.talleybonemarrow.org and “like” the Andy Talley Bone Marrow Foundation on facebook.